Bracket play began in the 2015 NY2LA Sports Spring Extravaganza on Saturday. As teams advanced further in their quest for a title, the Iowa Barnstormers and 2018 wing Joe Wieskamp won two games, showing why they’re a forced to be reckoned with in the 15U Division. There’s a lot to like about Agau. 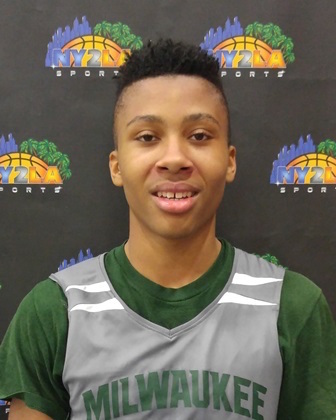 A super athletic two-guard with a high skill set, Agau is difficult to check offensively. Agau threw home some vicious slams in transition and also scored off the dribble from all over the floor at a high rate on Saturday. A lengthy, athletic wing, Agau could continue to get a lot better in a hurry. We might not be seeing the big scoring performances we’re accustomed to from Anderson, but he’s becoming a more well-rounded lead guard. Each game in this tournament, Anderson has been around 10 points, 5 assists, and 5 rebounds per game, while showing a better understanding of how to orchestrate an offense. Anderson led Wisconsin Academy to two wins on Saturday, scoring when needed, but focusing more on running the show. Hauser had a huge second half, scoring 20 of his game-high 29 points in a win over DTA in the Platinum Bracket. Leading his team from behind, Hauser was unconscious from beyond the arc in the second half. He made it look easy at times, simply squaring up and shooting over defenders. Its pick your poison with Larson. If you back off him, his sharpshooting abilities will wear out the net. If you get up on him, Larson has blow-by speed and great vision to make plays in the paint. Larson led Howard Pulley to an easy win over Next Level in the nightcap with a game-high 11 points and a number of assists in limited duty. Lucas led the Spartans to an easy win over ECI Prospects Saturday morning. The junior floor general was sensational in the open floor, making the right reads and blowing the game open with electric transition play. Lucas had a game-high 14 points and more than a handful of assists in the win. McCaffery has all the skills offensively and can see a play developing before it happens. A terrific inside-outside threat, the Iowa commit scored and assisted at will in a blowout victory over Real Athletics. McCaffery was in double figures in both wins for the Barnstormers, picking his spots very well and making a number of highlight plays. You never know how a young player will react to the coaches who line up to watch him during the live period, but Wieskamp calmly goes about his business each game out. The freshman had 21 points in a win over Minnesota Lockdown Saturday morning. 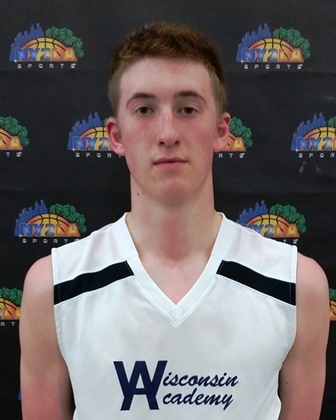 Wieskamp is a very skilled wing who can do it all offensively. He has a sweet stroke from downtown and an advanced mid-range game that’s very difficult to contest. Coming into the tournament under the radar, Basala won’t stay quiet for long. A hard-nosed, high-motor wing, Basala provides many of the hustle plays, but also packs a lot of punch into his game offensively. The 6-foot-6 sophomore can step out and shoot the ball from three-point range and is a big weapon in transition with his ability to the floor and flush the ball home. Bell had a huge scoring performance in a win over Howard Pulley Saturday afternoon. A great ball handler, Bell can get to wherever he needs to on the floor with some slick handles. Bell has the basketball on a string and used that advantage to get into the paint and pull-up from mid-range. A towering presence in the post, there’s not many players who have Chandler’s size in the 16U division. At 6-foot-9, 240-pounds, Chandlers combines his physical presence with a nice skill set. Chandler performed well with his back to the basket and finishes shots with a purpose. An active defender, Chandler keeps his opponents out of the paint and off the glass. DTA caught fire and nearly pulled the upset against Wisconsin Academy in the Platinum Bracket. Clement was at the forefront, scoring a team-high 14 points, including three timely triples. Clement was also very stout on the perimeter, making things tough for the Academy guards. The long wiry wing had a strong effort in a victory over the Minnesota Warriors. Hau continues to round into a solid talent and he put a versatile skill set on display as he knocked down try balls, scored in the post and finished in transition. A solid effort for the emerging sophomore wing. Lane is a strong guard with some deceptive speed and athleticism. He scored a game-high 16 points in an easy win over Real Athletics Saturday afternoon. Lane was able to score and distribute in transition. He also did a nice job of working his way into the paint off the bounce and shielding off defenders with his strong frame. Lane also led the Barnstormers with 18 points in a win over the Illinois Stars later that afternoon. Pipes orchestrated a big second half comeback, although the Stars would end up losing to the Iowa Barnstormers in Platinum Bracket play. Pipes caught fire, hitting just about everything he took inside and out. A dribble drive guard that can create his own shot, Pipes is nearly impossible to stop when he’s feeling it. Pipes also did a nice job of keeping his eyes up and finding open teammates when the double teams started coming his way. He finished with 21 points in Saturday’s loss. Thomas is an athletic forward with a high motor. He powered his way to a double-figure scoring effort, finishing hard at the rim and able to play above the basket even off two-feet. Thomas flirted with a double-double, controlling the glass and getting his teammates the ball in stride of outlet passes which led to easy breaks. Wilkinson shot the ball well in a win over ECI Prospects Saturday night. Using a nice-looking stroke, the junior went for a game-high 15 points in what was a defensive slugfest throughout. Wilkinson has decent size at 6-foot-3, and a long wing span to help him shoot over defenders. Wilson had 16 points in a win over Next Level Saturday morning. The long, athletic wing was in the right place at the right time for most of the game, making himself available in transition for easy finishes. The 6-foot-6 sophomore is an intriguing athlete with some offensive and defensive skills slowly budding, but the physical tools are there. Joe Wieskamp is receiving interest from Iowa, Nebraska, Creighton, Wisconsin, and Northern Iowa. Devonte Lane has interest from Iowa, Iowa State, Nebraska, Creighton, and Drake. Trevor Anderson has offers from Drake, Toledo, Wisconsin-Green Bay, South Dakota State, and Lehigh. Wisconsin, Indiana, Northwestern, and Virginia are among the programs interested at this time. Aguir Agau has interest from Creighton, Nebraska, and Denver.